The offending tweet from Herb Street. It was the stark, casual, easy laziness of our return to racism that was so disappointing, and yet so predictable. Moments before, John Joe Nevin had fought himself to a standstill in an effort to deliver another Olympic gold medal for his country. An honourable silver later and you would have thought the red carpet would be rolled out from Dublin airport to Mullingar. 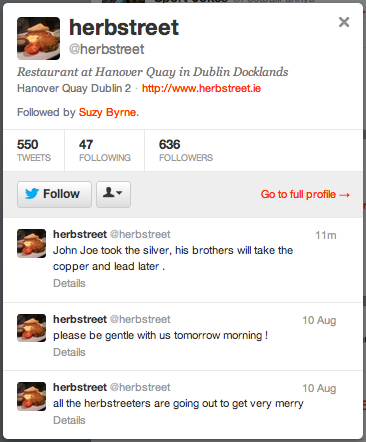 Instead, whoever controls the Twitter account of the Herb Street restaurant in Dublin decided to put Nevin back in his place. In a single tweet (see image), he and his family were just another bunch of thieving Travellers. It wasn’t a case of Nevin going from hero to zero – he simply returned to where he and his people have always been for many in Irish society. Then came the defence of Herb Street – first the operator of the account tried (laughably) to claim that “a prat” had taken his or her phone and posted the now-deleted “joke”. It’s the online equivalent of “the dog ate my homework”. Then other Twitter users started to ask what the big deal was – it was only a joke. And of course they were right – it was ‘only’ a joke. But here’s the big deal- it wasn’t a joke furtively shared amongst friends in a pub, an aside soon forgotten. It was a very, very public joke, and in very bad taste, in front of an audience of thousands during the biggest sporting event on the planet, perpetuating one of the most damaging prejudices about the Travelling people, from the account of what was previously a reputable business in Dublin. That was the big deal. Many seemingly failed to grasp that fact, and more defences came. The joke was wrong. Denying making it was wrong. Not apologising properly was – and is – wrong. It took thirteen hours for a lame effort at an apology to be made – with no acceptance of responsibility, or no explanation of how the tweet came to be sent. Now I know (or used to know) a lot of Travellers back in Dublin. I know how annoying and abrasive and aggressive some of them can be. I know that some can be violent, and I know that there are Travellers involved in criminal behaviour. I’ve run into them on several occasions here in Sweden too, and it hasn’t often been a positive experience. But I also know good, decent Travelling people who frown on all that, who see the value of education and integration and wrestle with their traditions and their instincts as they strive to give their families a better future. I know of people heartbroken when their children come home with more tales of how they were barred from shops or called ‘dirty knackers’ by passers-by for no reason. I know of the families who encourage the John Joes of this world to work hard and look after themselves, who fill them with pride and desire to do well for their families, their people, their country. I know how they struggle with those who – on both sides – say that there is no point, because they’ll never be allowed in. We’ll never let them in. We will never accept them. Instead, we’ll let them represent our country, and then when we’re done with them we’ll go back to the old ways and make jokes denigrating them. Maybe, thanks to some idiot at Herb Street, now is the time to start the dialogue needed, but I doubt it can happen. Maybe Herb Street can make it up to John Joe and his family by telling them the truth about how the tweet came to be posted, and what they’re doing about it. Then maybe they could put the kettle on and invite us all over to discuss how his success in the boxing ring as part of Team Ireland could be translated into other areas of society. I just hope their food isn’t as tasteless as their jokes, and that it doesn’t take thirteen hours to get something resembling service – or a proper answer.